Age As on 1-07-2019, Relaxation as per Rules. Educational Qualification : IMA/OTA- Passed Graduation in any Discipline from any Recognized University. INA- Passed BE/B.Tech Degree from any Recognized University. AFA- Passed Intermediate with Physics, Maths and Graduation or BE/B.Tech Degree from any Recognized University. 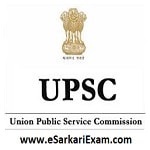 Eligible Candidates can Submit Application at the Official Website of UPSC latest by 3rd Sept 2018. Click on CDS II Exam 2018 Link. Now Open Apply Online Website. Open Online Application for Various Examination Link.